Since 1990, 19 journalists have been killed in Jammu and Kashmir. Note: This article was first published on June 14, 2018 and is being republished in the light of United Nations declaring November 2 as the International Day to End Impunity for Crimes Against Journalists. New Delhi: The assassination of the editor-in-chief of Rising Kashmir Shujaat Bukhari once again brings under the spotlight how unsafe the state of Jammu and Kashmir is for journalists. Over the decades, scores of mediapersons have been abducted, beaten and tortured for simply doing their job. It’s not as though ‘shooting the messenger’ is the norm only in J&K. Across India, journalists have been killed in the line of duty for reporting on the corrupt practices employed by politicians, business barons and even petty criminals. A simple change in the winds of politics can become the trigger that eventually takes aim. As Kashmir has suffered one conflict after the other, beyond the state’s citizens, journalists have paid the price too, facing death threats and even suffering attacks on their family members as a result of efforts to silence them. The numbers when it come to violence against journalists in the state are staggering. Since 1990, 19 journalists have been killed in Jammu and Kashmir, including Bukhari. Their deaths have been at the hands of militants, paramilitary forces, state police and the Indian armed forces. Under the threat perception of the state, one must also not forget how much self censorship a journalist in a conflict-afflicted state like Jammu and Kashmir has to practice. Compare this to the Committee to Protect Journalists’s numbers from across India – 27 journalists in India have been killed since 1992 for their work, and in all, over 77 journalists and media workers have been killed in India between 1992 and 2018. Though the motive has been established in some cases, the investigation in most cases remains as just so many loose ends. In 1990, Doordarshan director Lassa Kaul, who had been facing the ire of militants for a while over his reporting in Kashmir, was shot dead on the streets in Srinagar as he left his residence to go meet his parents. The murder was caught on camera by photojournalist Mehrajuddin. The Doordarshan station was then shut down for three years. Just last year, senior photojournalist Touseef Mustafa of AFP was held by a policeman of sub-inspector rank in a choke hold while he was covering separatist leaders outside Syed Ali Geelani’s residence on the Sringar Airport road. Other journalists – Farooq Javed and Shuaib Masoodi, Sheikh Umar and Imran Nissar – also sustained injuries during the attack. 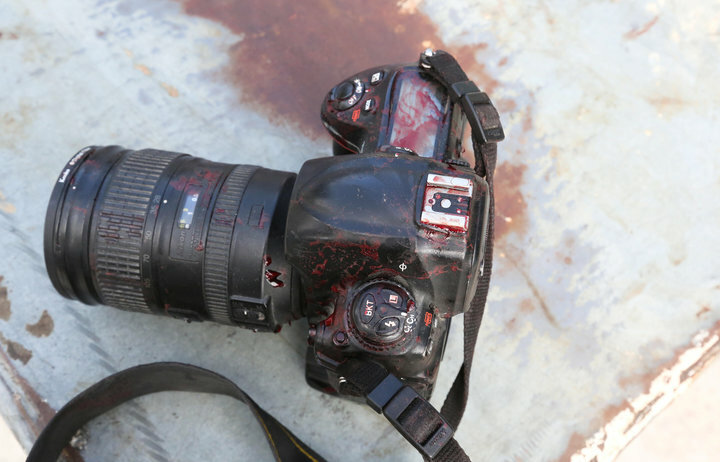 Before Bukhari, in 2008, two journalists will killed while on duty. As Free Press Kashmir reports, Ashok Sodhi, a photojournalist and then chief cameraman of Daily Excelsior, was killed on May 11, 2008 in Samba district of Jammu. Sodhi was caught in crossfire close to India’s border with Pakistan. Then on August 13, 2008, Javed Ahmed Mir, 35, was shot dead while covering a demonstration. According to the BBC, apart from being a cameraman, he was also had a second job as a textile worker to help support his wife and three children. October 16, 1992: Syed Ghulam Nabi, Joint Director Information, was kidnapped and held captive for four days. On October 20, his dead body found with torture marks. September 10, 1995: Mushtaq Ali, an Agence France-Presse and Asian News International photographer, opened a package at an office in Srinagar’s Press Enclave. The “parcel exploded, severing Ali’s left hand, disfiguring his face and severely injuring his right hand and abdomen”. He died three days later. April 10, 1996: Ghulam Rasool Sheikh, editor of the Urdu-language daily Rehnuma-e-Kashmir and the English-language weekly Saffron Times, was found dead floating in Kashmir’s Jhelum River. Family members alleged that Sheikh was abducted and then killed by a paramilitary group. In virtually all of these cases, there has been no proper investigation, let alone arrests and prosecutions. When it comes to attacks on journalists that have not resulted in deaths, that list is long. From being the targets of explosions, parcel bombs and having grenades being thrown at their homes, to being held as hostages, shot at, having their family members harassed, and even being arrested, journalists in Kashmir face this all on a nearly daily basis. Earlier this year, the National Investigation Agency arrested and charged a Kashmiri photojournalist, Kamran Yousuf, with stone pelting, a charge he and the media fraternity in Srinagar has refuted. During his bail hearing, the NIA told the court that Yousuf was not a bona fide journalist since he did not cover government development projects and blood donation drives by the army. In March 2018, the trial court granted him bail, and questioned the evidence the prosecution had assembled against him.